Innovation often comes from places you would least expect. In order to make a lighter crankset, we made it bigger. To add stiffness, we used less material. 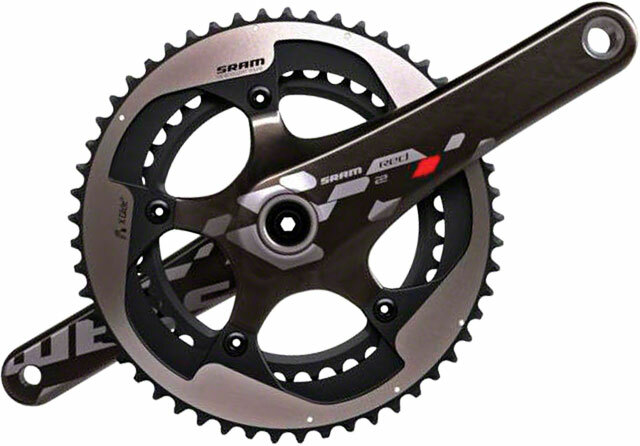 The new SRAM RED 22 Exogram Crankset is completely hollow all the way to the spider. Its hidden bolt pattern makes better use of carbon fiber to further improve stiffness and shed weight. The stunning X-GlideR chainrings are optimized for use with the Yaw Technology in the front derailleur, delivering seamless, flawless performance. Exogram technology uses a large, hollow cross section all the way to the spider, minimizing weight while maximizing stiffness. Our stiffest crank ever. Hidden bolt pattern leverages the characteristics of carbon fiber while presenting a sleek appearance. Stiffer X Glide R chainrings feature thicker construction, advanced shift timing pins and ramps, which are optimized for shifting with the Yaw front derailluer.Arm MaterialCarbonChainring MaterialMachined AlloyWeight557g (BB30 172.5mm 53×39 BB not included)CompatibilitySRAM RED 22 & SRAM Force 22 Yaw Front Derailleur, SRAM RED 22 & PC1170 chainsTechnology Highlight(s)Exogram, X GlideR46/36T gearing is only available in 170mm, 172.5mm and 175mm arm lengths.